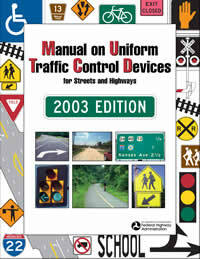 The 2003 Edition of the MUTCD, dated November 2003. is available in both PDF and HTML. Details how the 2003 Edition differs from the 2000 MUTCD with Revision 1, December 2001. The 2003 MUTCD may be viewed in HTML format, in addition to PDF format. HTML format is accessible to individuals with disabilities, per Section 508 of the Rehabilitation Act. While every effort has been made to assure complete consistency between the PDF and HTML files posted on the MUTCD web site, the PDF files constitute the official version of the MUTCD. The PDF files take precedence over any potentially conflicting MUTCD text or figures that may occur in the HTML files.